A delicious dessert treat that combines berries and chocolate. 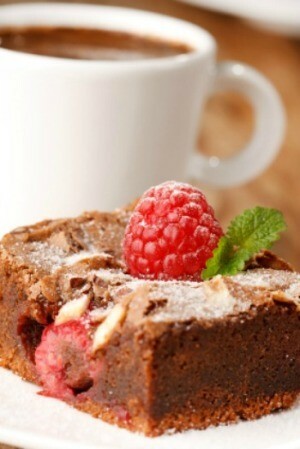 This page contains raspberry chocolate bar recipes. Super yummy dessert! Love the chocolate/raspberry flavors blended together. Preheat oven to 350 degrees F. Combine flour, sugar, nuts, butter, and egg until crumbly. Set aside 1 1/2 cups of the nut mixture. Press the remaining mixture into the bottom of a greased 9x13 inch baking pan. Spread jam over all. Sprinkle with chocolate chips, then with the remaining crumb mixture. Bake for 40-45 minutes or until lightly browned. Cool completely in pan on wire rack; cut into bars. Preheat oven to 375 degrees F. Combine flour, oats, baking soda, and salt in small bowl. Set aside. Combine butter and sugar in medium bowl and beat with mixer on medium speed until blended. Add flour mixture and stir until well blended. Mixture will be crumbly. Remove 3/4 cup of dough. Toss with chocolate chips. Set aside. Press the remaining dough into an 8 inch square pan and spread evenly. Top with jam and sprinkle with remaining chip mixture. Bake 30 minutes or till golden brown. 1 cup unblanched almonds, opt. Grease a 9x13 inch baking pan. Preheat oven to 350 degrees F. In large bowl, combine flour and sugar; mix well. With pastry blender or two knives, cut in butter until mixture resembles coarse crumbs. With fork, stir in beaten egg and almond extract, until all ingredients are just moistened. Remove and set aside one cup of dough. Press remaining dough onto bottom of prepared pan. Spread jam evenly over dough to within 1/2 inch of edges. In medium bowl, combine one cup reserved dough, chocolate mini pieces and, if desired, almonds; mix well. Sprinkle over jam; press lightly with fork. Bake 35-40 minutes, or until top is golden. Let cool in pan on wire rack. While still slightly warm, cut lengthwise into 4 equal strips; cut crosswise into 12 equal strips. Cool completely in pan.